Cardio Plein Air offers several different workout programs for all fitness levels and ages. 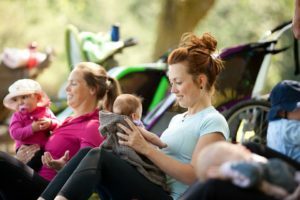 New Moms will find our Cardio-Poussette (Stroller) classes which are designed specifically by our kinesiologists so Moms can work out safely with proper mouvements and exercises for their changed bodies. These workouts are offered in the West Island in Grier Park and Bois-de-Liesse Park, from Monday to Thursday mornings. After 10 months to a year and once new Moms get stronger and feel ready to intensify their workouts we offer Bootcamp and Cardio FIT classes, which are both faster paced and more intense including Jumping Jacks and Burpees! We are also introducing to the West Island our beginner Cardio-Jogging class, which includes proper jogging techniques to increase endurance and distance safely without injury! New Moms should get the ‘OK’ from their doctor or a pelvic floor therapist before starting to run! Our Jogging classes is offered at Eccelstone Park and Cap St-Jacques Park on Monday and Thursday evenings! West Island Moms are welcome for a free trial, and can receive a 10$ discount with their new membership! Our Spring session starts next week March 26th and runs ’til June 18th. Looking forward to working out together!